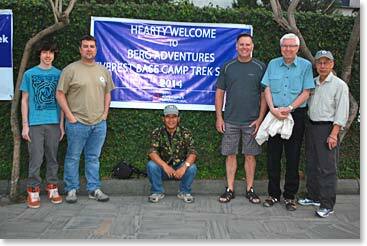 Everyone is in Kathmandu and we are underway! 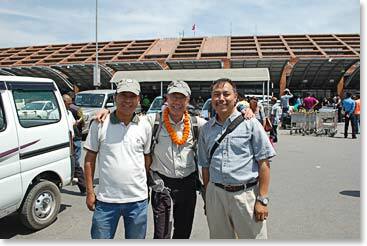 The Edmonton guys, arrived at Kathmandu’s Tribhuvan International Airport on a flight from Doha, Qatar Saturday morning. Early on Sunday afternoon Dave Cohn arrived on Thai Airways flight 319 from Bangkok. The Yak and Yeti Hotel is a nice place to relax before the trek begins. On Monday the guys will be off on a tour of the ancient streets of Bhaktapur. We will keep you updated about their adventures in Kathmandu and, beginning on Wednesday with the flight to Lukla, about their experiences along the trail to Everest Base Camp. At the airport Dave was all smiles with Min and Temba after along flights from LA and Bangkok. At the Yak and Yeti: Jackson, Ryan, Min Jim Allen, Jim Brown and Dave.